It’s time to say goodbye to Thorpe’s as Metroline finally subsumes the company beneath their own identity. 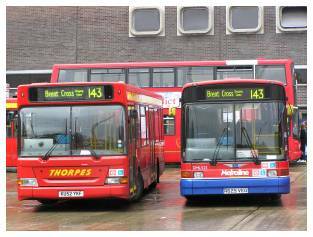 Beginning with the Stationlink a decade and a half ago, the company founded by Frank and Jim Thorpe grew steadily to the point where it was running half a dozen routes and a large fleet of Dennis Darts out of a dedicated base in Wembley. 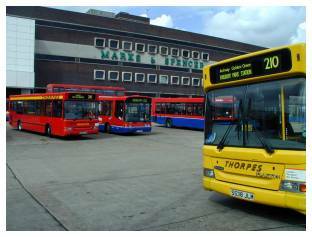 Only later in Thorpe’s’ existence were double-deckers operated, firstly Metrobuses and then a handful of former Grey-Green Volvo B10M rebuilds. The company even expanded enough to buy out a neighbour, the Metropolitan Omnibus company formerly known as London Traveller, but itself fell to a buyout which brought it into Metroline’s ambit. This photo selection shows perhaps the peak of Thorpe’s, which was the 210’s flame-inspired livery carried by DLF 38 (S538 JLM) in the foreground, while repainted stablemate DLF 30 (S530 JLM) sits in one of the usual spaces in Brent Cross, this shot being taken on 21st April 2000. The right-hand picture was taken at the same spot five years and one month later, with a somewhat different scene to record. 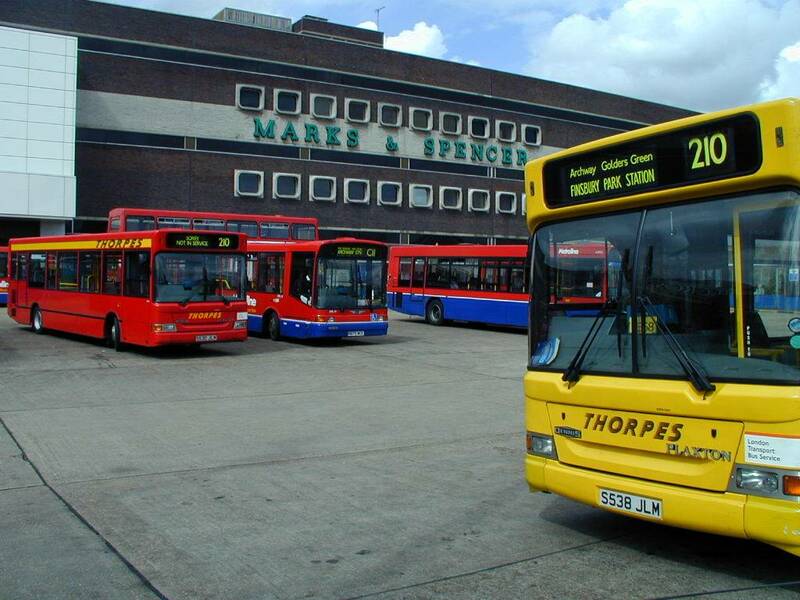 Not long after another major win by Thorpe’s, that of the 316 from Metroline, the company was bought by the latter and its operations divided up. 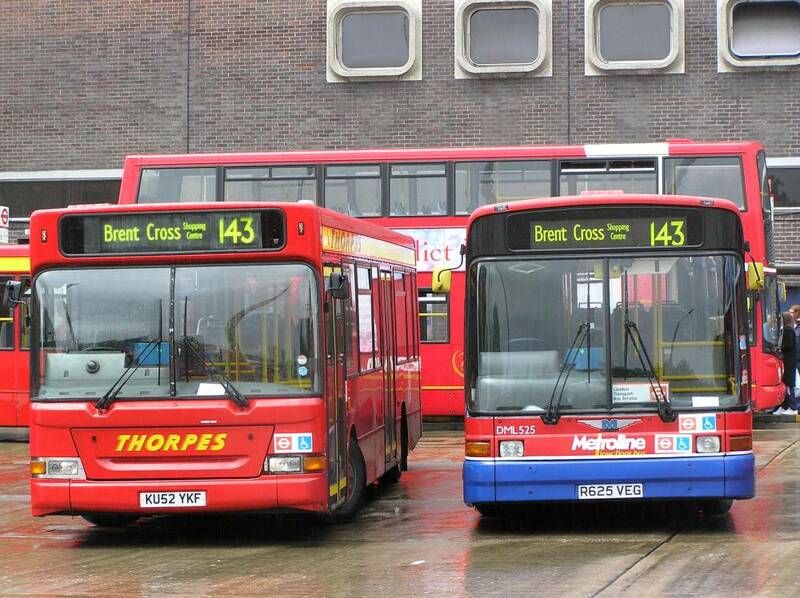 The first order of business was to shuffle the routes, with the 143 taking the 316’s place as the host of the red and yellow Darts, although with the transfer of the 326 and C11 into the same garage it was possible to see both liveries in action simultaneously, as demonstrated by DLF 99 (KU52 YKF) and DML 525 (R625 VEG) on the 143. It doesn’t look like any fleetnumbers will be changed, probably mercifully for crazy folks like me who have to record all this stuff. Tomorrow I’ll be bidding farewell to Armchair, the other London bus company finished off by Metroline. I’m sure you’ll agree Matt it would be nice if somebody subsumed Metroline, or for that matter TFL! London Transport has a nice ring to it, trips off the tongue easily and some people are still using the term LT. A unified, integrated transport operator/authority! Didn’t someone have that idea in 1933? Kind of makes sense. I am surprised, here in Tennessee I had no idea this was going on. Thanks to the internet we can find these things out. Will the 316 gain double-deck buses? buy wheelchair lifts on The M defended.